Perhaps the most essential feature of the new K 1200 R Sport is the semi-fairing mounted firmly to the frame and bearing the same headlight as on the R 1200 S. Integrated harmoniously into the overall design of the motorcycle, the semi-fairing retains a clear and free view of the impressive engine and running gear technology. The fairing not only emphasises the sporting character of this Big Bike, but also enhances its wide range of riding opportunities and general use versus the K 1200 R.
Offering significantly improved wind protection particularly advantageous at high speeds, the new BMW K 1200 R Sport is even more suitable for covering long distances at high speeds. It is indeed the ideal motorcycle not only for dedicated riding pleasure on the race track, but also for all-out enjoyment on country roads and motorways, offering the rider the option to adopt a more upright seating position than on the even more sporting and dynamic K 1200 S.
As the sister model of the K 1200 R, the new K 1200 R Sport features the same drivetrain and suspension technology. With maximum output of 120 kW (163 hp), kerb weight of just 241 kg or 531 lb, and its innovative Duolever and Paralever suspension, the new model offers the highest standard of riding dynamics and performance at all times and under all conditions. 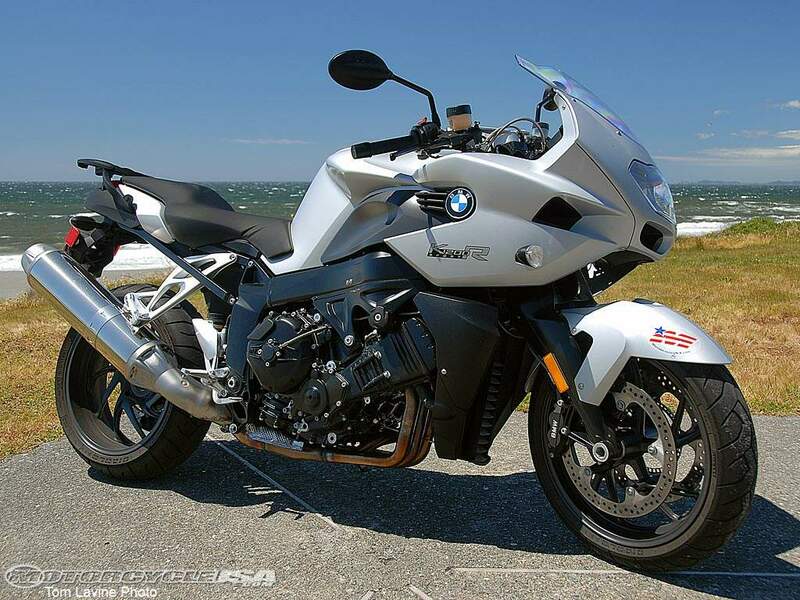 Over and above these outstanding features, the BMW K 1200 R Sport offers a wide range of talents intentionally not provided on the K 1200 R without a fairing. These include supreme versatility in all kinds of situations, enhanced riding comfort, and even better performance and handling at high speeds. And at the same time the new machine offers all the virtues typical of a Roadster, such as sharp and crisp handling, sporting performance, and a relaxed seating position. The new BMW K 1200 R Sport addresses the ambitious sports rider with a penchant for progressive, “naked-bike” technology and a wide range of motorcycling options on a truly versatile machine. Offering an ample choice of accessories carried over in most cases from the K 1200 R, the new K 1200 R Sport ensures optimum comfort and a truly outstanding riding experience particularly on long distances. Semi-fairing mounted firmly on the frame and a new headlight emphasising the sporting character of the K 1200 R Sport and improving its riding comfort particularly at high speeds. High-performance four-cylinder inline power unit tilted 55° to the front, maximum output 120 kW (163 hp), maximum torque 127 Nm (94 lb-ft). Fulfilment of the strictest environmental standards thanks to Digital Motor Electronics and three-way catalytic converter. High-performance aluminium suspension with Duolever wheel mount at the front and EVO-Paralever wheel mount at the rear. Unladen weight of only 241 kg or 531 lb in road trim, perfect balance ensured by a low centre of gravity, supreme handling qualities. Relaxed seating position for an active riding experience. Electronic immobiliser featured as standard. On-board network with CAN-bus technology. Electronically adjustable ESA suspension available as an option. Latest-generation Integral ABS (semi-integral version) available as an option. Tyre pressure control (TPC) as an option. Wide range of optional extras and sports accessories. New: BMW Motorrad High Performance Parts for sporting customisation. As the latest model in the K-Series, the new BMW K 1200 R Sport boasts the same top-of-the-range technology as its sister models. 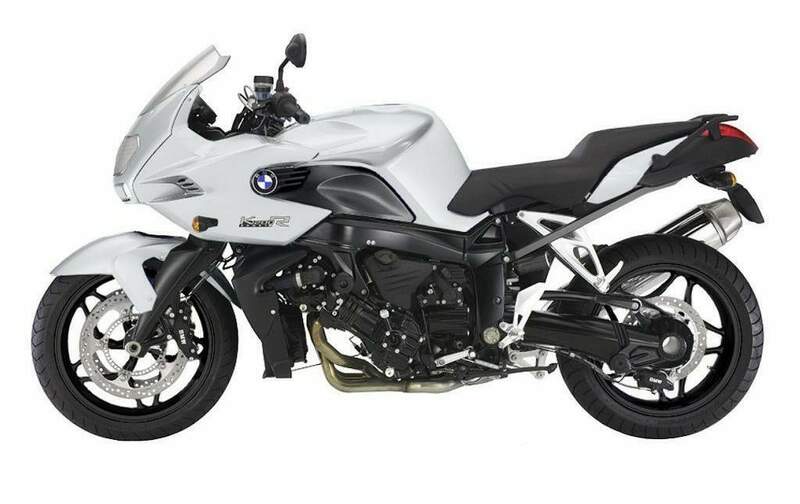 Specific details of the drivetrain, suspension and running gear, brakes and on-board network are described in detail in the press kit on the K 1200 S and, respectively, K 1200 R.
Semi-fairing with integrated headlight mounted firmly on the frame. Developed in the wind tunnel, the front fairing made of plastic elements is perfectly matched to the motorcycle, combining good looks with equally good protection from wind and weather. Defined air guidance around the side spoilers guides the wind smoothly around the rider, reducing wind pressure on his head and upper body. Despite its compact and slender dimensions, the fairing on the K 1200 R Sport offers significant safety and protection even at high speeds enhanced greatly over the standard offered on the Roadster with its large windshield. And apart from extra comfort, the engineers at BMW Motorrad have also succeeded in enhancing the motorcycle’s dynamic potential, with the rider benefiting from excellent wind protection above all at high speeds. The strikingly designed headlight in clear glass look and with free-form technology integrated in the fairing is the same as on the sporting R 1200 S, the asymmetric design of the headlight alone showing clearly that this is a genuine BMW. The reflectors are tailored geometrically to the rider’s illumination requirements, interacting together with the H7 bulbs arranged next to one another to provide excellent light intensity and illumination on the road ahead. Beneath the headlight, the fairing proudly boasts two typical BMW kidney grilles interacting with the wheel mounts and radiator trim panels also optimised in the wind tunnel to ensure an efficient flow of cooling air to the radiator. The fairing components at the side are fastened to the motorcycle by integrated plastic mounts, avoiding the need to use visible bolts or screws and again emphasising the elegant, sophisticated look of the new BMW K 1200 R Sport. High-performance four-cylinder inline power unit. The new K 1200 R Sport is driven by the same engine that ensures supreme riding pleasure on the BMW K 1200 R: Like on the Roadster, the high-performance power unit develops maximum output of 120 kW (163 hp) at 10,250 rpm, with peak torque of 127 Nm (94 lb-ft) at 8,250 rpm. These figures alone clearly underline the supreme acceleration and drive power of the K 1200 R Sport standing out as a sporting multi-talent in every respect. Dry sump lubrication and the position of the compact power unit with its cylinder bank tilted 55° to the front ensure a very low centre of gravity offering, first, the desired load on the front wheel and, second, sporting, dynamic handling qualities at all times. The six-speed gearbox on the K-Series is a light and compact integrated transmission unit fully contained within the engine housing. The gearbox itself as well as the gear increments are the same as on the other K-models. Like its sister models, the new K 1200 R Sport boasts Duolever front suspension combining superior precision and directional accuracy with optimum suspension comfort. The entire structure is very strong and torsionally resistant, naturally being conceived and designed for light and smooth handling. And thanks to its smooth response, the front wheel suspension offers a precise feeling for the road surface, taking in and smoothly absorbing even the smallest bumps. Yet another feature of the kinematic Duolever is its anti-dive brake action remaining virtually consistent throughout the motorcycle’s entire spring travel. All told, therefore, the new K 1200 R Sport offers an ideal combination of everyday riding qualities and sportiness also through its suspension and running gear, once again emphasising the dynamic character of the new machine from BMW Motorrad. 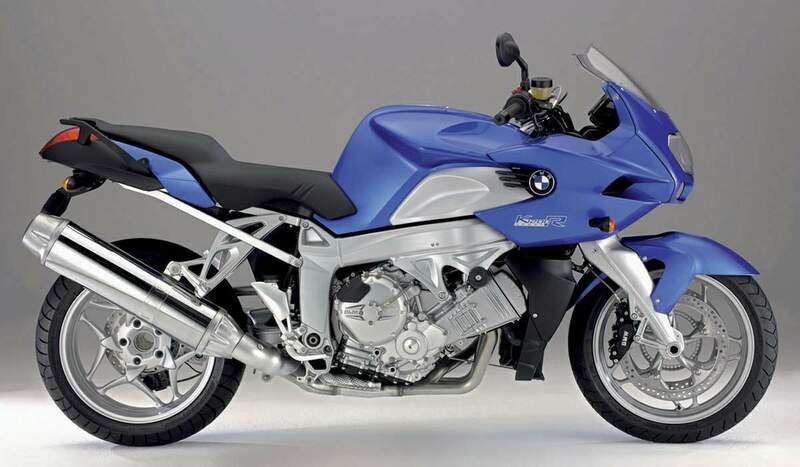 Developed by BMW Motorrad for the K-Series, the Paralever is a highly stable lightweight construction efficiently combining the transmission of forces and rear wheel guidance, and connecting the spring strut via a progressive kinematic pivot point. It also offers significant benefits in damper response and progressive action. attractive, filigree look of the rear suspension. The new K 1200 R Sport is available as an option with BMW Motorrad’s Electronic Suspension Adjustment (ESA) allowing the rider to adjust the spring/damper set-up conveniently to his particular requirements simply by pressing a button. And as a further option available straight from the factory, the new K 1200 R Sport also comes with TPC Tyre Pressure Control. EVO brake system and Integral ABS as an option. The new K 1200 R Sport is fitted as standard with BMW Motorrad’s proven EVO brake system also featured on other models in the K- and R-Series. With brake disc diameter of 320 millimetres/12.60´´ at the front and 265 millimetres/10.43´´ at the rear, this brake system is simply ideal for excellent stopping power also when riding fast and dynamically. And the flexible steel brake lines featured as standard on the EVO brake system not only look good, but also ensure a consistent pressure point at all times. The new generation of BMW Motorrad Integral ABS with semi-integral function introduced in summer 2006 is available as an optional extra. This system controls the front and rear wheel brakes from the handbrake lever, while the footbrake lever acts exclusively on the brake at the rear as a configuration particularly well-suited for the sports-minded motorcycle rider. CAN-bus technology and electronic immobiliser. A standard feature of the current BMW Motorrad K-Series is that the electrical and electronic components communicate with one another via a modern databus network exchanging digital information through one single wire. Introduction of this single-wire system has dramatically streamlined the on-board electrics, significantly reducing the need for cables and connectors as well as the weight of the entire wiring system. A further point is that only this technology is able to provide reliable, comprehensive and rapid troubleshooting and diagnostic functions. Yet a further benefit of CAN-bus technology is that it enables the service technician to read out data and/or re-define parameters. And an electronic immobiliser with direct exchange of data between the ignition key and the motorcycle’s electronic system is also standard on the new K 1200 R Sport. As a special variant of the K 1200 R optimised for streamlining and enhanced protection from wind and weather, the K 1200 R Sport comes with the same overall design characteristics as its “sister” model. 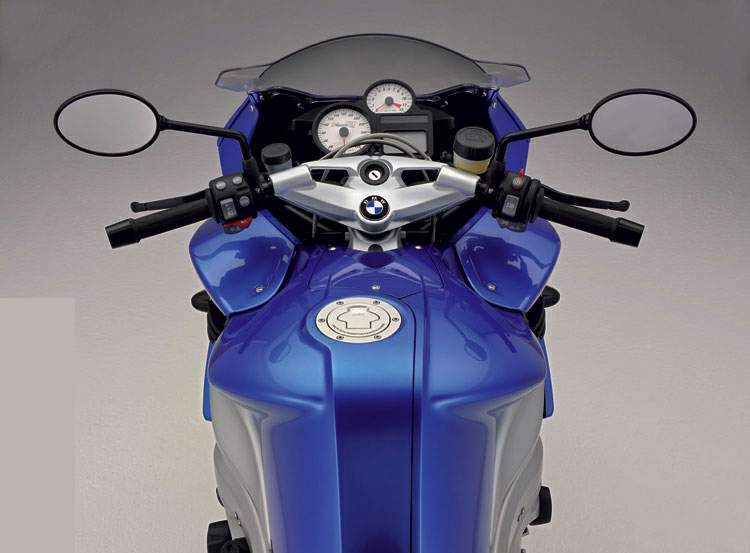 The optical focus of the new machine is however on the dynamically enhanced frontal area, although the free, unrestricted view of the motorcycle’s technical components and key aesthetic elements again retain the full impression of innovative engine and suspension technology as striking BMW qualities. A further point is the semi-fairing offering a new, even more sporting look and making the K 1200 R Sport a truly unique model within the BMW Motorrad K-Series. 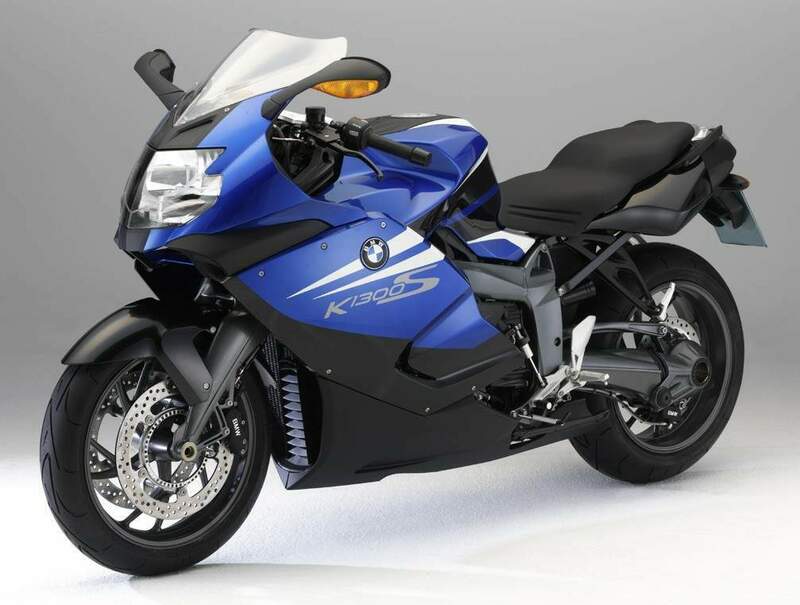 The new K 1200 R Sport is available in two colour variants interpreting the character of this semi-fairing Roadster in a different way each time. White-Aluminium metallic matt is a special metallic paintwork combining a truly “technical” look with supreme clarity. The matt surfaces hardly generate any reflections, thus emphasising the specific lines and contours of the motorcycle through the interaction of light and shade alone. The engine and chassis components finished in black, in turn, create a clear and distinctive contrast giving the overall machine a particularly masculine and straightforward look. Cosmic Blue, the second, truly powerful colour option, places greater emphasis on the motorcycle’s sporting flair. This colour highlights the dynamic lines of the machine and accentuates the semi-fairing in an even more impressive manner, the engine and suspension components finished in Silver rounding off the overall impression of the new K 1200 R Sport finished in Cosmic Blue.